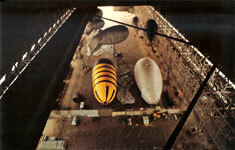 The Warm Airship Project was the brainchild of Anthony Smith, with technical assistance from balloon builder and partner Malcolm Brighton. It was the world's first attempt at building a hot air airship. 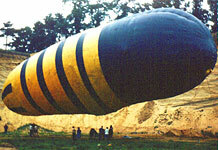 Although it never flew successfully, much was learned from the attempt and applied to future airship projects. The Warm Airship Project began as a vision in 1963, after Anthony Smith witnessed Ed Yost's first flight of a Raven hot air balloon across the English Channel. 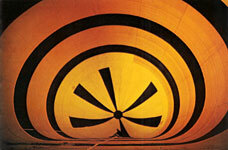 While at Raven in South Dakota In 1964, Mr. Smith had an opportunity to fly in the very same balloon. This flight spurred him to ponder the possibilities of an airship lifted by the same inexpensive propane fuel. Shortly after his return to England, work began on what was to become known as the Wasp. Joined by Malcolm Brighton, Michael Price and a host of other friends and helpers, the comparitively diminutive airship began to take shape inside the massive R-101 shed at Cardington. 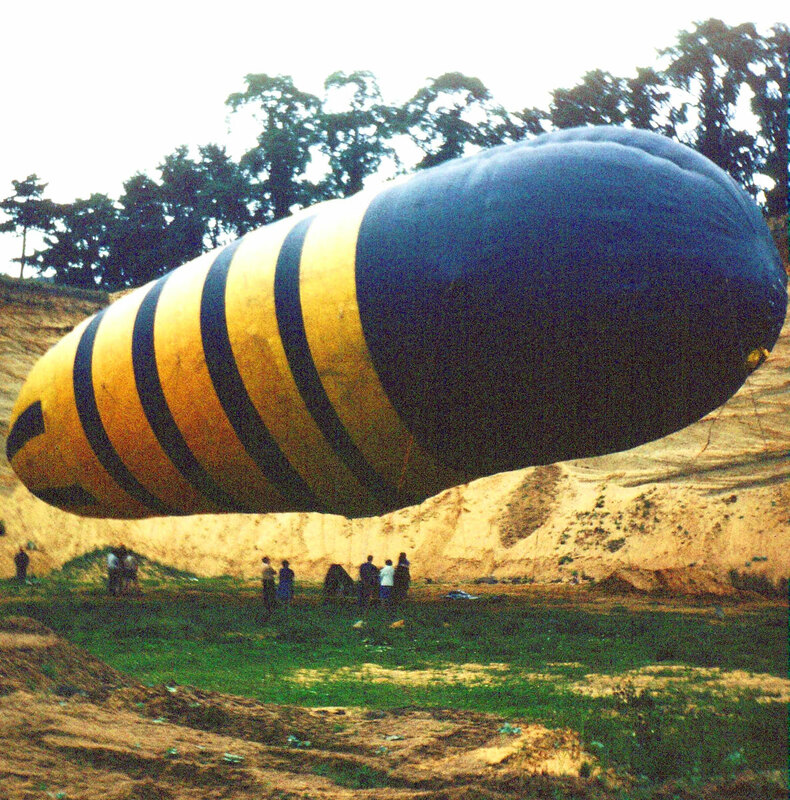 Unfortunately, as soon as the authorities saw the Wasp's propane burner in operation, the project was hastily removed from the hangar, where underground hydrogen pipes still laid. A new home was found at a sandpit in Farnham. The 125-foot long, 85,000 cubic foot airship was constructed from 1200 square yards of 2.5-oz Polyurethane-coated Terylene fabric. Back then, to the sandpit at Farnham, and to Wasp. with the arrival of that particular winter the place started to become water-logged, but this difficulty was only marginal compared with the problems embedded in our airship. 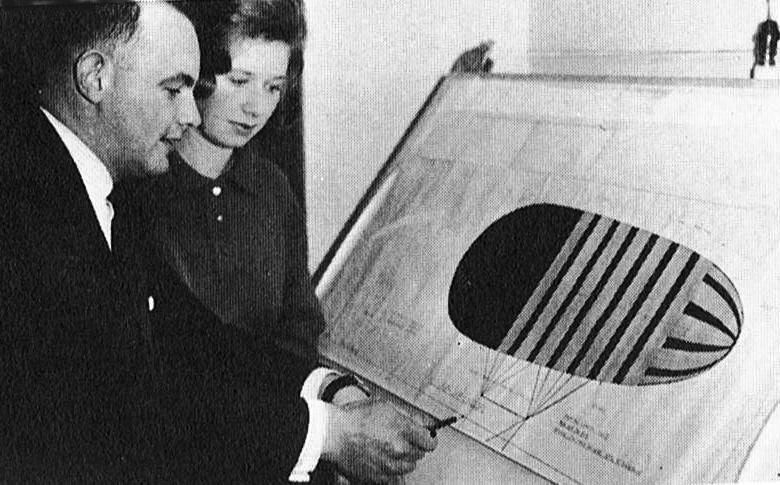 The more we achieved, the more deeply we dug, the greater were the set-backs which we unearthed. We stared disconsolately at the reflection of Wasp's inflated hull in the puddles all about us, and saw only too clearly her misshapen curves, her inherent instability. The trouble was partly a lack of pressure within, and partly a fault of the hot air running from nose to tail and then back again. Both faults exacerbated each other. 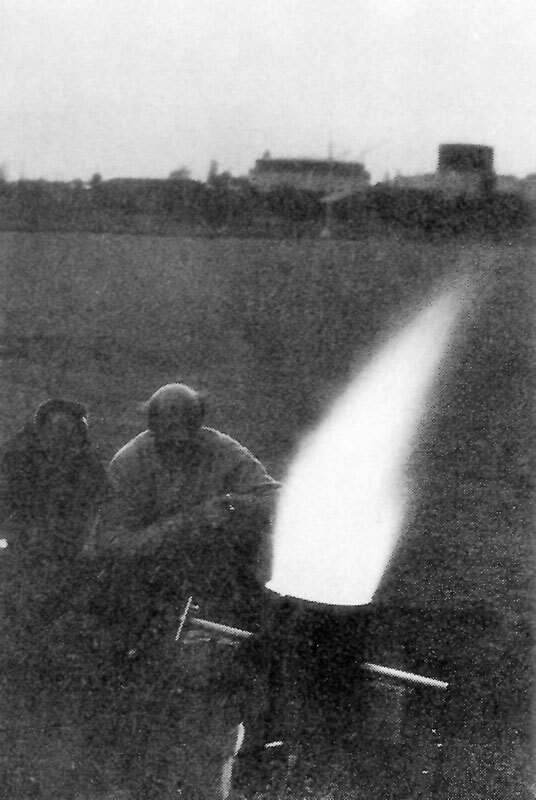 The more deformed the shape became due to pressure lack, the more air ran from end to end. And the more this instability manifested itself the worse the shape became. Therefore, or so we argued in that sodden pit, something must reinforce the shape and something else, like a set of baffles, must stop all that inside surging. To improve the shape we introduced nylon tubes and inflated them. To keep them inflated we had to devise ways of mending the inevitable punctures. To prevent punctures we had to keep all sand away from all tubes (and the sandpit suddenly seemed less suitable as a location). When the nylon was finally abandoned we used sewer-men's rodding poles instead. These worked well but only gave Wasp a different malformed shape. Slowly it dawned upon us, or more rapidly if it was raining or cold or wet and windy, that something was fundamentally wrong with Wasp. We were spending time patching up a sinking ship. It was high time we got her out of our pit and returned to a drawing board. It was occasion to think again. It was also high time to earn some more money, and our modest group disbanded. Wasp would have to wait.